Remembering the "World War I eclipse"
Glorious totality, as seen during the recent total solar eclipse of July 22nd, 2009. Credit: Narayan Mukkavilli. Used with permission. Known as the "War to End All Wars,"—which, of course, it didn't—World War I would introduce humanity to the horrors of modern warfare, including the introduction of armored tanks, aerial bombing and poison gas. And then there was the terror of trench warfare, with Allied and Central Powers slugging it out for years with little gain. But ironically, the same early 20th century science that was hard at work producing mustard gas and a better machine gun was also pushing back the bounds of astronomy. Einstein's Annus Mirabilis or "miracle year" occurred less than a decade earlier on 1905. And just a decade later in 1924, Edwin Hubble would expand our universe a million-fold with the revelation that "spiral nebulae" were in fact, island universes or galaxies in their own right. Indeed, it's tough to imagine that many of these discoveries are less than a century in our past. It was against this backdrop that the total solar eclipse of August 21st, 1914 crossed the eastern European front embroiled in conflict. Note that the graphic depicts a Europe aflame and adds in the foreboding description of Omen faustum, inferring that the eclipse might be an "auspicious omen…" eclipses have never shaken their superstitious trappings in the eyes of man, which persists even with today's fears of a "Blood Moon." A race was also afoot against the wartime backdrop to get an expedition to a solar eclipse to prove or disprove Einstein's newly minted theory of general relativity. One testable prediction of this theory is that gravity bends light, and astronomers soon realized that the best time to catch this in action would be to measure the position of a star near the limb of the Sun—the most massive light bending object in our solar system—during a total solar eclipse. 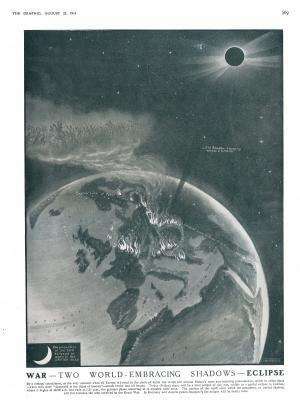 The advent of World War I would scrub attempts to observe this effect during the 1914 and 1916 eclipses over Europe. The total solar eclipse of August 21st 1914 was a member of saros cycle 124, and was eclipse number 49 of 73 in that particular series. Eclipses in the same saros come back around to nearly the same circumstances once every triple saros period of 3 times 18 years and 11.3 days, or about every 54+ years, and there was an eclipse with similar circumstances slightly east of the 1914 eclipse in 1968—the last total eclipse of saros 124—and a partial eclipse from the same saros will occur again on October 25th, 2022. All historical evidence we've been able to track down suggests that observers that did make it into the path of totality were clouded out at show time, or at very least, no images of the August 21st 1914 eclipse exist today. Can any astute reader prove us wrong? We'd love to see some images of this historical eclipse unearthed! And, as with all things eclipse related, the biggest question is always: when's the next one? Well, we've got another of total lunar eclipse coming right up on October 8th, 2014, again favoring North America. 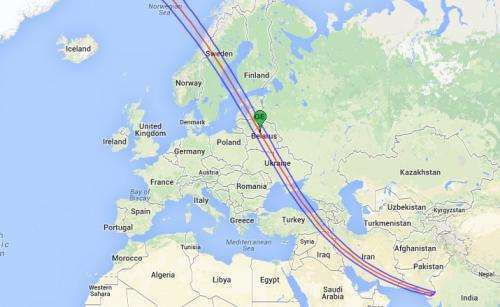 The next total solar eclipse occurs on March 20th, 2015 but is only visible along a path covering the Faroe and Svalbard Islands, with a path crossing the Norwegian Sea. 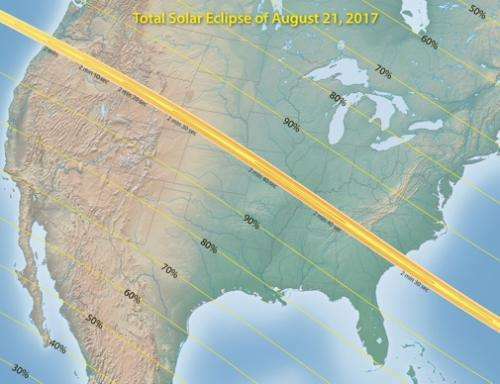 But, by happy coincidence, we're also only now three years out this week from the total solar eclipse of August 21st, 2017 that spans the contiguous "Lower 48" of the United States. 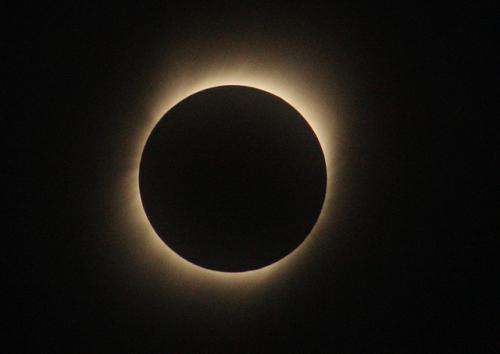 The shadow of the Moon will race from the northwest and make landfall off of the Pacific coast of Oregon before reaching a maximum duration for totality at 2 minutes and 40 seconds across Missouri, southern Illinois and Kentucky and will then head towards the southeastern U.S. to depart land off of the coast of South Carolina. Millions will witness this event, and it will be the first total solar eclipse for many. A total solar eclipse hasn't crossed the contiguous United States since 1979, so you could say that we're "due"! Already, towns in Kentucky to Nebraska have laid plans to host this event. 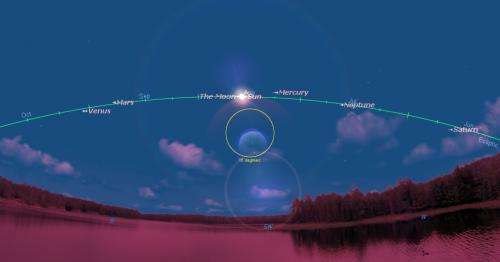 The eclipse occurs towards the afternoon for residents of the eastern U.S., which typically sees afternoon thunderstorms popping up in the sultry August summer heat. Eclipse cartographer Michael Zeiler states that the best strategy for eclipse chasers three years hence is to "go west, young man…"
It's fascinating to ponder tales of eclipses past, present, and future and the role that they play in human history… where will you be on August 21st, 2017?